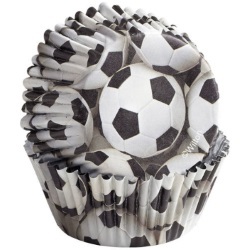 Bring crisp, clear realistic imagery to your cupcakes with Wilton ColorCups Standard Baking Cups featuring realistic-looking soccer balls. Perfect for any soccer-themed event from your next tournament or world-cup party to the youth-league post-game pick-me-up. Package contains 36 baking cups 2 in. (5 cm) dia. with a soccer ball design. Imagine the cheers you'll get for bringing soccer-themed cupcakes to your next tournament, World Cup party or youth-league post-game pick-me-up.